these were inspired by the matterhorn macaroons at disneyland. i’ve never had one there (i always get seduced away from them by macarons or peanut butter cookies or ice cream or other delicacies), but it seemed like something perfect to make at home, and perfect to use as an introduction to my disney series. fall quarter of sophomore year of college, i was craving disneyland something fierce. it was a caustic combo of having a high school friend stay in my apartment with a bunch of her friends and take them into disneyland for free without me (she works for a disney store at home, and can get herself + up to 3 others into most disney parks in the world for free a number of times per year), and being very bored at school. i even convinced some of my college friends to go with me to downtown disney on a tuesday night (what is studying) bc i wanted to go to disneyland so bad (this visit just made matters worse). and although i was dying to go to the laughing place, i couldn’t bring myself to drop $100+ after i had a taste of free disney (that friend i mentioned before has gotten me in previous times). so what’s a disney deprived girl to do? make disney food, ofc. even if she isn’t deprived at the moment (if you saw my anaheim trip post a month ago, you’ll see that i was lucky enough to get to go again). these macaroons have half sweetened and half unsweetened coconut. this gives you two options post-baking: you can either keep them plain (my preferred happy ending), or dip them in white chocolate and dust with powdered sugar a la jolly holiday bakery in disneyland. sure, you could dip them in chocolate and coat with more sugar anyways, but having some unsweetened coconut inside the macaroons helps cut down on all that sweetness. i straddled the line and added a sprinkling of powdered sugar to the ones photographed here, because my white chocolate refused to cooperate that day. 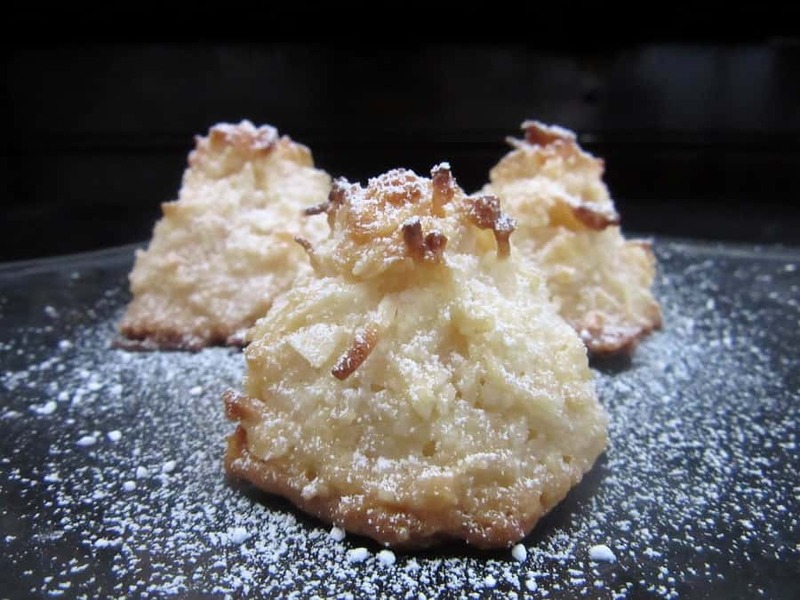 these macaroons (whether or not you make them into matterhorn macaroons) are dense and chewy in the middle, with a great crunch on the outside. they lose this texture after the first day, but if you toast them (gently! otherwise they get a little… toasty), you’ll see that the loss was happily temporary. the flavor is solidly coconut (if you didn’t expect that, i might need to ask you to re-evaluate this recipe), but there’s also caramelly notes that come out when the sweetened condensed milk evolves into something closer to dulce de leche. they’re the perfect way to celebrate everything you like about disney, or if you’re like my anti-disney dad, it’s just a delicious dessert. Combine the coconut, condensed milk and vanilla in a large bowl. Whip the egg whites and salt until they make medium-firm peaks. Mix a quarter of the whites into the coconut mixture (this makes it much easier to do the next part), then fold in the rest of the whites. Refrigerate the batter for 5-10 minutes; this helps prevent them from spreading out too much during baking. Drop the batter onto parchment-lined sheet pans lined with parchment paper using a 1 3/4-inch diameter ice cream scoop. If you want to make Matterhorn macaroons, shape the scoops of batter into tall mountains (they will slump down a bit during baking). Bake at 325F for 25 to 30 minutes, until golden brown. Remove them from the sheets (a butter knife is much easier to use than the typical spatula), and cool on a wire rack. These taste best on the day that you bake them, but you can toast leftovers to get back the same texture. thanks hillary! and i’m sure chocolate would be amazing (when is it not?!). These remind me of my childhood. Mum used to make them regularly. They look delicious. thanks, sherry! my mom used to hate coconut when i was a kid, so i can’t say i have childhood memories of these, but i love them now!